Lil' Bits "Cottage Garden" continues with the feel and wonder of the FQB - Cottage Garden Collection, but adds in so many more clusters of elements predone for you, labels with and without phrases as well as sentiment tags that may work perfectly for the feel and theme of your scrapbook layouts, cards and craft projects. 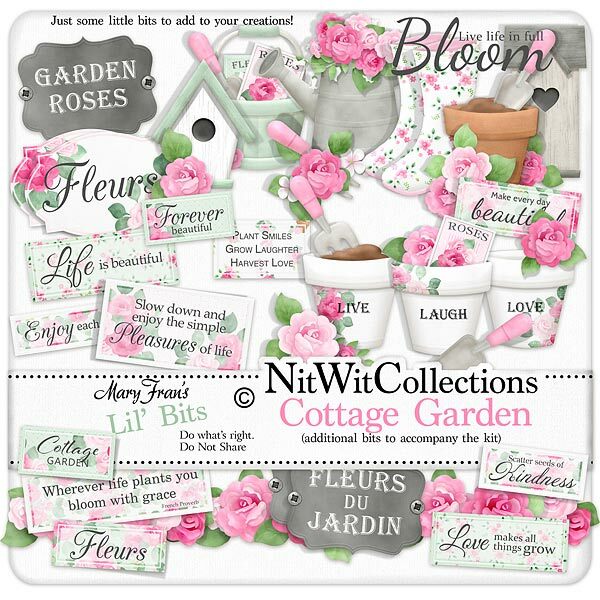 Don't miss out on these digital elements as they are not included in the FQB "Cottage Garden" Collection so don't pass these by! 1 Border of roses strung together to form a beautiful garland! Can you see this in your creation?! 1 Cluster of elements that include the gardening boots, birdhouses, watering can with flowers and more. A very easily used digital element to base your creation around! 1 Label - "Fleurs du Jardin"
1 Label - "Garden Roses"
1 Sentiment - "Live life in Full Bloom"
1 Sentiment tag - "Enjoy each Moment"
1 Sentiment tag - "Life is Beautiful"
1 Sentiment tag - "Scatter Seeds of Kindness"
1 Sentiment tag - "Love makes all things Grow"
1 Sentiment tag - "Wherever life plants you...."
1 Sentiment tag - "Slow down and enjoy...."
1 Sentiment tag - "Make every day Beautiful"
1 Sentiment tag - "Cottage Garden"
1 Sentiment tag - "Fleurs"
1 Sentiment tag - "Forever Beautiful"
1 Sentiment tag - "Plant smiles...."